It is mid week and boy can i smell the weekend coming 😛 Now i hope you are on track to having a week full of pips! This will make the weekend even better. In the previous EUR/USD forex forecast review we noted the bullish possibility of the currency pair. The confidence level in the Euro Zone seemed to be picking up and risk taking activities were happening. The SMA 200 is now resting on the 1.36 region and it may prove to be a strong resistance. 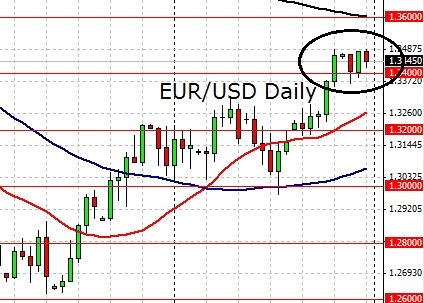 The EUR/USD seems to be consolidating right above 1.34 for the moment and we may be entering into the ranging phrase. If you refer to the weekly chart, the currency pair is now at the top of a bearish channel. The European Central Bank ECB conducted a loans operation and the take up for 3 year loans were more than expected. While this suggests a need for extra liquidity, many believe that this will have an effect of stimulating growth in the euro zone economy. Germany is also reporting a two decade low unemployment rate which suggests an economic pick up for the largest economy in Europe. Across the Atlantic, it was reported that the US economy is expanding at a 3% annual growth rate. This is greater than expected and is widely seen as a positive sign.